As security lines are becoming longer and more crowded, we felt that these holiday travel tips might be helpful. 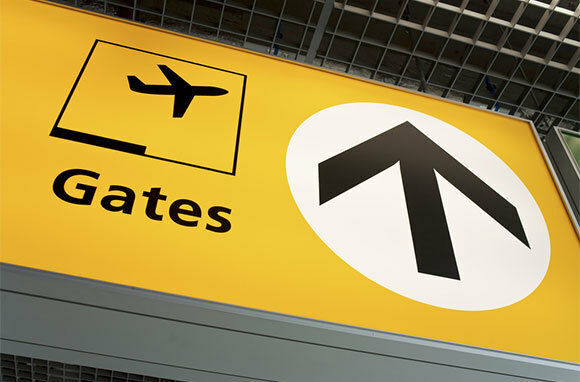 Enjoy 10 ways to get to your gate faster! 1. Apply for TSA PreCheck: With the TSA PreCheck program, you’ll get to use a special screening lane with fewer people in it. Plus, you’ll get to keep on your shoes, light outerwear, and belt, and also leave your liquids and laptop in your carry-on. You pay $85 for these privileges, though (good for a five-year membership in the program – it may have increased to $100 – or so we have heard). 2. Prepare for Airport Security: If you don’t want to turn over your personal information and $85 to the TSA for PreCheck, being prepared can help you get through the regular security line faster. Make sure your liquids follow the 3-1-1 rule and your plastic bag is easily accessible in your carry-on. Forgetting to take out your liquids can trigger a luggage search, which will significantly slow you down. Also, wear slip-on shoes to get through the scanners faster, and be sure to use a TSA-approved laptop case so you don’t have to take your computer out of your bag. 3. 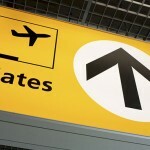 Upload Your Boarding Pass to Your Phone: Have a smartphone? Then you don’t need to mess with paper tickets! Many airlines give you the option to download an electronic boarding pass to your smartphone, meaning you don’t have to waste time printing your own ticket (at home or at the in-airport kiosk). It’s easy to do, but just make sure that your phone is charged enough to get you to the gate. 4. Download an Airport-Map App: Airports can be confusing, and it can be hard to find the maps posted throughout the terminals—not to mention that these maps are often tough to read. Before you fly, download maps of the airports you’ll be traveling through, and you’ll be able to plan the best way to get to your gate at a glance, plus see what’s around it. That way, you won’t trek all the way to your gate only to realize that you walked past the only good food options 15 minutes ago. We love GateGuru, which has great airport maps that show everything from gate locations to restaurants and amenities. 5. Don’t Check a Bag: Nothing’s a bigger waste of time at the airport than checking a bag (especially if you have to transfer in a new country and must collect and recheck your suitcase yourself). Save some time by going carry-on only. 6: Invest in a Quality Carry-on Suitcase: Upgrading to a well-made carry-on suitcase can help you speed to your gate faster. Go for one with smooth wheels that won’t trip you up as you zigzag through crowds on your way from checkpoint to departure. We like these bags from Lipault, Briggs & Riley, and Biaggi. 7. Pack Your Own Snacks: Bring your own snacks—you’ll save time, money, and calories. Here are 10 easy recipes for tasty treats you can make yourself and easily transport to the airport. Also bring an empty water bottle to fill up post-security—there’s never a line for the water fountain. 8. Get a Seat at the Front of the Plane: If you’ve got a tight connection, get to your next gate quickly by selecting a seat at the front of the plane. You’ll be one of the first off the flight, rather than having to wait for 20 rows to get up, collect their belongings, and haul their bags out of the overhead compartments. 9. Get a Seat at the Front of the Plane: If you’ve got a tight connection, get to your next gate quickly by selecting a seat at the front of the plane. You’ll be one of the first off the flight, rather than having to wait for 20 rows to get up, collect their belongings, and haul their bags out of the overhead compartments. 10. Check In Online: One of the biggest time wasters at the airport is waiting in line to check in in person. Skip all the hassle by checking in online before you leave. Even if you’re on the road and don’t have access to a printer, you can check in online and print out your boarding pass at the airport self-help kiosk, where the line is usually much shorter than at the check-in counter. You can still do this even if you’re checking a bag, but you’ll usually have to wait in a bag-drop line afterward.